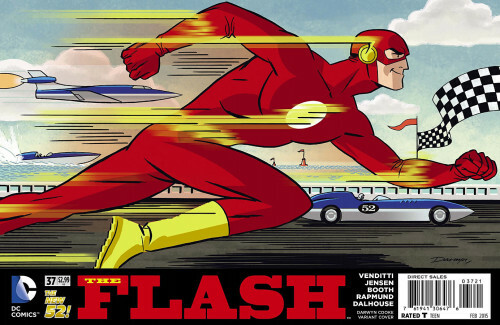 What were your favorite Flash comic and TV stories of the year? And what’s got you excited about next year? Vote in our 4-question poll, then come back here to discuss! Update: The results are in! 113 people voted in the survey, and there were some pretty clear winners. 1. What was your favorite Flash TV episode of 2014? 2. What’s your favorite Flash comic book story from 2014? The Future Flash storyline by Jensen/Venditti, Booth & Rapmund took a whopping 46% of the vote, followed by “History Lessons” (Flash #27-29), the Keystone Killer storyline by Buccellato and Zircher, at 19%. I listed the Mashup Gang story that ran in parallel to the Future Flash on its own, and it only came in at 7%, after a near-tie (one vote difference) between Season Zero’s story of Mr. Bliss’ circus and the updated origin story in Secret Origins #6. 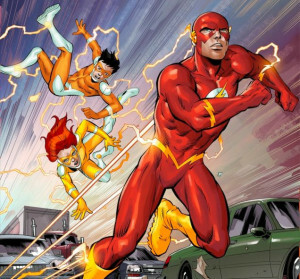 Which Flash comic book story are you most looking forward to in the first half of 2015? 4. 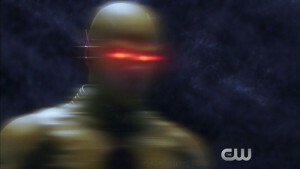 Which confirmed guest stars are you most excited about for the second half of Flash: Season 1? This one’s a lot more even: Coming into first place was the Trickster at 27%, followed by the return of the Reverse Flash at 22% and the debut of Heat Wave & Captain Cold at 20%. 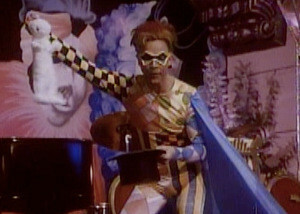 I wonder how much of the Trickster love is for the character, and how much is for the return of Mark Hamill? In any case, we here at Speed Force hope you had a good 2014, and wish you a happy new year! This entry was posted in Fun, Timely and tagged New Year, Polls on December 31, 2014 by Kelson. The latest chapter of Flash Season Zero was released on Monday, featuring the first half of “Smoak Signals,” guest-starring Felicity Smoak from Arrow. Written by Marc Guggenheim and Andrew Kreisberg, art by Marcus To with colors by Kelsey Shannon. On Wednesday, DC adds three more Silver-Age issues of The Flash: #120-122, featuring “Land of the Golden Giants,” “The Trickster Strikes Back,” and the first appearance of the Top in “Beware the Atomic Grenade!” Stories written by John Broome, pencils by Carmine Infantino with inks by Joe Giella and Murphy Anderson. This entry was posted in Out This Week on December 30, 2014 by Kelson. 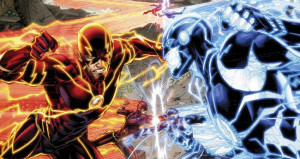 Our present-day Barry Allen is trapped in the Speed Force, powerless, while his alternate future-Barry (the “All-New, All-Murderous Flash”) has taken over his life. The Speed Force has more secrets than we thought, and the people Barry loves may be getting their first real hints that something is wrong here – all in the latest issue of THE FLASH! This entry was posted in Reviews and tagged FLASH #37, Future Flash, Review, Speed Force on December 28, 2014 by Ed Garrett. I was going to post a different cover tonight, but then I noticed Bart saying “Sweet Christmas!” on this one. With the recent Luke Cage casting announcement, it seemed appropriate. Have a merry Christmas if you celebrate it, or just enjoy your day if you don’t. 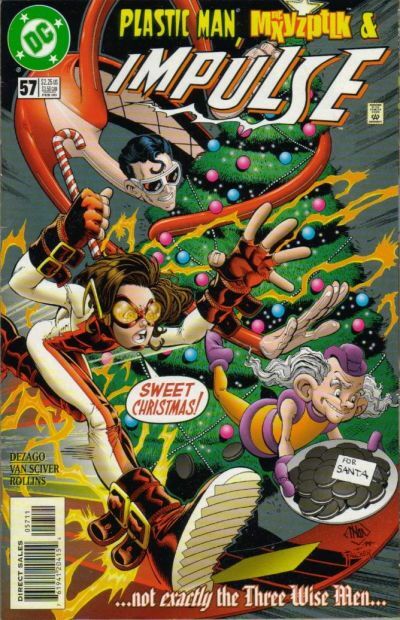 And check out our gallery of Flash Christmas covers through the years. This entry was posted in Covers, Timely and tagged Christmas, Holiday, Impulse on December 24, 2014 by Kelson. Flash #37 is out this Wednesday, featuring Barry Allen trapped in the speed force, Iris West uncovering a shocking secret, and of course the “all-murderous” Future Flash taking over Barry’s life. A preview is available. Meanwhile, DC will be releasing three more Silver Age Flash comics from the early 1960s to their digital backlist on Wednesday: #116, #118 and #119. (Flash #117, Captain Boomerang’s first appearance, is already available.) These include “The Man Who Stole Central City!” “The Doomed Scarecrow!” (not that one) and “The Mirror-Master’s Magic Bullet!” plus backup stories featuring Kid Flash and the Elongated Man. This entry was posted in Out This Week on December 23, 2014 by Kelson. 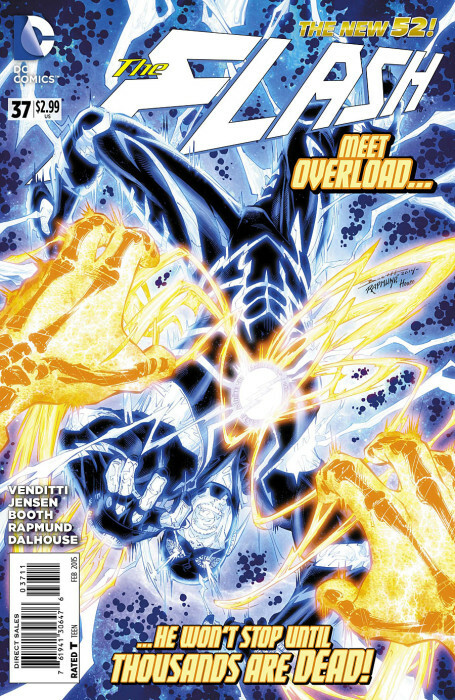 The Flash #37 is out next week, and CBR has a preview of the issue. Present-day Barry Allen meets more people trapped in the timeless world of the speed force, while back on Earth Iris West’s investigative reporting uncovers a shocking surprise. And that doesn’t even get to the “all-new, all-murderous Flash” promised by the solicitation text. This entry was posted in Flash News and tagged Preview on December 19, 2014 by Kelson.